Discussion in 'Our Products & Services' started by Cyber, May 25, 2017. Versions of extender: unlimited, limited (400 players), test (20 players). Popular functional: Autoloot, exp on/off, offline trade, up to 100 buff-slots, voice-command for adena convertation, settings for inventory slots count, etc. Shadow weapons with an ability to create your own. Ability to create an NPC buffer with changed timings on skills without changing original skills. Flexible Game Master settings with an ability to limit every kind of right. Completely flexible enchanting system. Additional enchanting system settings: ability to save your enchant level after the failure; ability to set the level your enchant will drop to after the fail. Ability to create and set a "block buff" ability in order to prevent an over buff problem. Unique system of buff return after being cancelled. If turned on, allows a player to return his buffs after a certain amount of time which is a very useful tool for pvp servers. Completely flexible clan system settings that will allow you to set any kind of feature (penalties, crp points, number of clans in alliance etc) as you wish. Ability to provide special skills for heroes, nobles and clan leaders. Pvp-reward system with a built-in exploit protection system. Ability to create special locations with certain limits like: no pets; no summons; pvp area; trade-free area; limited level area, etc. Ability to limit players attack damage, move speed, etc. Ability to increase or limit amount of buffs including placing songs and dances on another line. Ability to deliver items for a player right through the database. 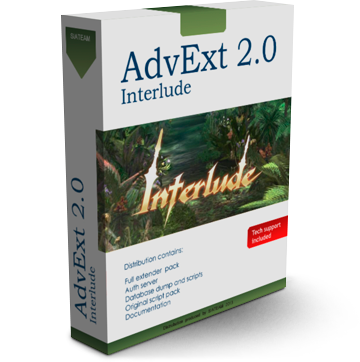 By purchasing AdvExt Interlude you are acquiring a set of components.